Aston Martin is hoping to break new ground in the super GT market in its centenary year with the launch of its new Vanquish Volante. Boldly described as ‘the ultimate Volante’ by its maker, the £200,000 convertible will feature the same V12 powerplant as the coupe and be capable of covering 0-62mph in 4.1 seconds. Due to go on sale in October, the new supercar will be Aston Martin’s first convertible with a full carbon fibre body. It will be capable of reaching a top speed of 183mph. 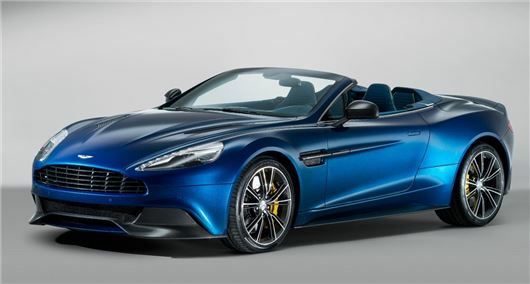 Arguably the most powerful production convertible to ever emerge from Gaydon, the Vanquish Volante will have a raft of improvements over the outgoing DBS, with the carbon fibre-skin being the most notable. Aston Martin claims the use of carbon fibre will make its new car 14 per cent torsionally stiffer than the DBS Volante, making it resistant to flex and better to handle than its predecessor. Significant efforts have been made to balance the car, with claims of near-perfect 51:49 weight distribution, which should present a solid platform for the 6.0-litre V12 engine to stretch its legs with a whopping 457lb ft of torque. Power will be directed through a six-speed paddleshift gearbox to the rear wheels and the chassis will benefit from adaptive dampers. The driver will be able to switch between three distinct modes: Normal, Sport and Track, delivering instant adjustment to the car’s ride and handling characteristics. The car’s braking system will feature third generation Brembo Carbon Ceramics and use 398mm x 36mm CCM discs with larger front pads and six-piston callipers, while the rear brakes will use 360mm x 32mm CCM discs with four-piston callipers. Labelled as a direct descendant to the One-77 supercar, the new Volante will share a number of styling cues, with a slim waist, elongated side strakes and LED rear light blades. Inside, the new Aston Martin promises to be practical and its triple-skin fabric roof will take just 14 seconds to fold. The 2+2 cabin will remain unchanged from the Vanquish coupe and the Volante’s boot will be surprisingly useful, measuring 50 per cent larger than the outgoing DBS, with 279 litres of space.